Start a revival! With essays, blog posts and the book Bamboozled Believers, I am adding my voice to a growing chorus of ordinary Christians who are calling for a new reformation. Supposedly we are living in the “last days” but preachers have been singing that fallacious song for hundreds of years. We reject the futurists’ delusions and we accept what the Bible teaches about Jesus’ second coming. In this essay you will get an overview of “fulfilled prophecy” and you will see what we are trying to do on this website. Stated as simply and concisely as possible, we are trying to start a revival! If Jesus didn’t return as promised, then the Bible is nonsense. And if he did return, then all of our end-of the-world doctrines are nonsense. Jesus never predicted the end of the “world”. He predicted the end of the Old Covenant “age.” The age of temple worship and animal sacrifice ended in AD 70. On the Day of Pentecost, Peter said that he was living in the “last days” before the “day of the Lord.” He said: “… the sun shall be turned to darkness and the moon to blood before the day of the Lord comes” (Acts 2:20). We know that Peter was not predicting the end of the world because he was quoting the prophet Joel and if you read Joel 2:30-32 you will see that after the sun goes dark and after the moon turns to blood, there are survivors in Jerusalem. So life goes on after day of the Lord. The “sun going dark” and the “moon turning to blood” are poetic language. We call prominent athletes and actors “stars.” That it a metaphor. The Bible uses the same metaphor when it says that the stars will fall before Jesus’ return. The “stars” that fell before Jesus’ return in AD 70, were the religious leaders (the stars) of Israel. 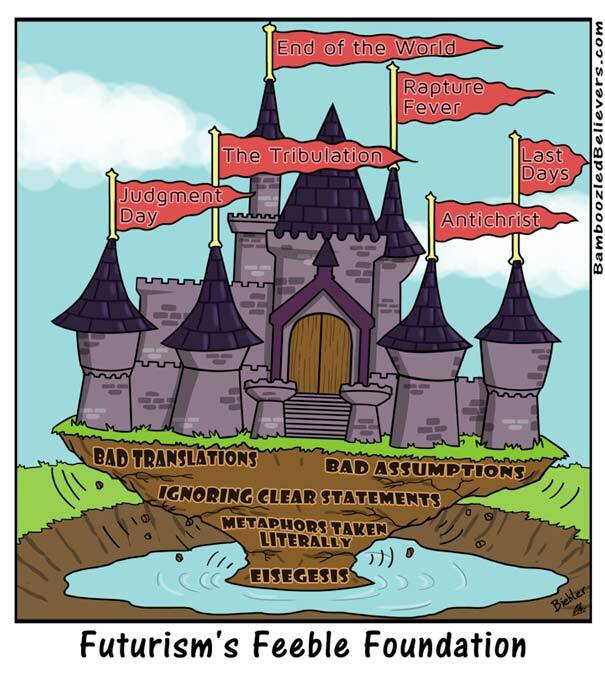 The futurists’ end-time delusions are fueled by metaphors that they take literally. The “last days” of the New Testament are not the last days of the planet, they are the last days before Jesus’ second coming in AD 70. He returned as he promised, and he took “vengeance” on apostate Israel in AD 70 (Luke 21:20-22). The “day of the Lord” in the New Testament is not the end of the world. It is the day when God used Roman armies to destroy Jerusalem and Old Covenant Judaism. Throughout the New Testament there are many references to that impending day of disaster; that day was imminent 2,000 years ago. It is not imminent today. Modern day Protestants do not call Luther a “heretic.” In fact they applaud him for correcting church error. This shows that we need a better definition of heresy. In Titus 3:10 Paul tells Titus that after two warnings, he should reject a man who is a heretic. According to Strong’s Concordance, the word that is translated “heretic” in this passage means “a schismatic follower of false doctrine.” Modern Protestants say that Luther was not a heretic because the church’s indulgence doctrine was false doctrine… in this case the orthodox church of his time was following false doctrine and as such the church was heretical! So yes, orthodoxy can be wrong. For over a thousand years virtually all Christians, Protestant and Roman Catholic, baptized their infants. Luther and Calvin also insisted that the “heretics” who practiced believer’s baptism should be executed. Infant baptism was most certainly orthodox doctrine. Yet modern day Baptists, Pentecostals, members of the Church of Christ, Mennonites, etc… insist that baptism is for believers, so they baptize only people who are old enough to make the choice to follow Jesus. Obviously the orthodoxy of the paedobaptists and the orthodoxy of the believer-baptizers cannot both be sound doctrine. Somebody’s orthodoxy is wrong. For over a thousand years the Roman Catholic Church executed purported heretics. After the Reformation, the Protestant churches also executed “heretics.” For example church historian Philip Schaff reports that the town of Geneva (population 15,0000) executed 58 heretics during Calvin’s time. Of those, 20 were women, burned as witches. The killing of heretics was orthodox Christian doctrine for a very long time. So, since God does not tell us to kill people with whom we have theological disagreements, we again see that Christian orthodoxy can be wrong. The people who killed “heretics” were heretics themselves! Since heresy is false doctrine and since the orthodox church has followed false doctrines, we know that orthodoxy can be wrong and therefore heretical! “Biblical Prophecies Fulfilled”… is it heresy? In Titus 1:9 Paul tells Titus how to deal with heresy. He says that an elder should “refute” those who contradict sound doctrine. Now, since sound doctrine comes from God’s Word, the only way to refute false doctrine is by reference to Scripture. So I invite you to be like the Bereans. Examine the Scriptures to see if the doctrines pertaining to “Biblical Prophecies Fulfilled” align with Scripture. If they do, then they are not heresy and the church’s orthodox teaching concerning “end times” is heresy. What Happened in AD 70? The Mosaic age ended when Roman armies destroyed the temple. When Jesus returned in AD 70 the very few Christians who had survived the great tribulation were raptured. Those who had died while the Old Covenant was in effect were resurrected and “rewarded according to their works.” The “last days” of the Bible are the last days before the stars fell (a metaphor) and the old heaven and old earth passed away (also a metaphor). Today, Christians belong to a spiritual kingdom (the kingdom of God) that is metaphorically called “the new heaven and the new earth.” There is no future judgment day for Christians because they have already passed from death into life… when their lives on earth end, they go to be with their resurrected Lord. Absent from the body is present with the Lord. No evil boogieman called “the antichrist” is about to burst onto the world scene and take over the “one-world government.” The antichrist myth is part of an elaborate edifice of eschatological absurdity that is built on bad translations, bad assumptions and metaphors that are taken literally. Start a Revival? How is this going to start a revival? I’ve been Bible-believing Christian for a long time; I know that sermons and Bible studies are carefully crafted to avoid a minefield of “problem” texts. We pay lip service to Bible study, but real Bible study is rare. Church Boards supply superficial books about the Bible to our small-group Bible studies because we don’t want them to “go off on some tangent.” We don’t want people asking questions that we cannot answer. I was a Board member who went off on a tangent. I read books by Russell, Stevens, Mills Preston, etc. and these books pointed to the spectacular truth that is outlined above. I now know the reason that our Bible studies are so shallow: our futurist paradigm blinds us to the clear teaching of God’s Word. I also know that the scales fall from our eyes when we realize that the New Testament writers were predicting events that happened in AD 70. That truth has the power to heal divisions between churches and within churches. When the Bible makes sense, hopefully real Bible studies will flourish… and real Bible study is a prerequisite for real revival. 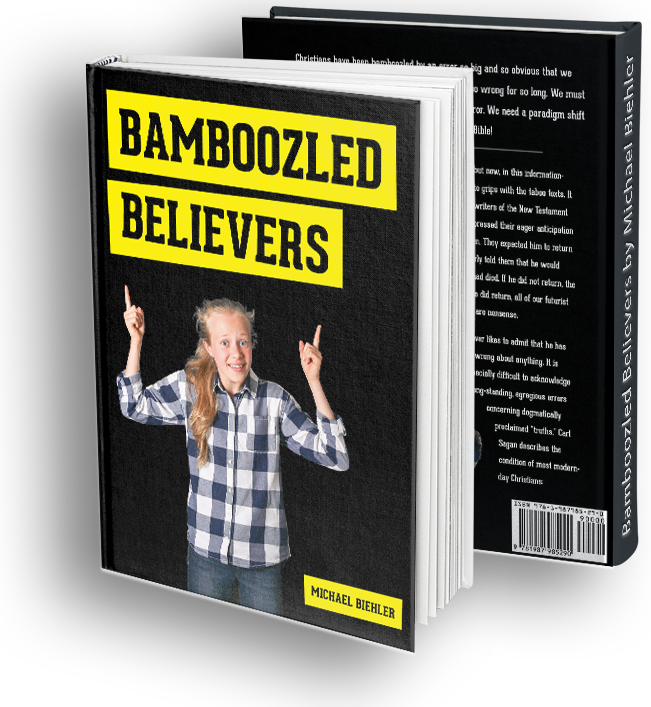 To be “bamboozled” is to be so committed to a false belief that you cannot bear to admit, even to yourself, that you are wrong. Pride is the biggest impediment to acceptance of the simple fact that Jesus’ second coming has already happened. The Greek word “aion” means “age” not “world” (Matt. 24:3). John Wycliffe made that translation error about 700 years ago and it was repeated in all of our English translations until quite recently. All modern translations correct the error, but the bad theology that developed form the error has not yet been corrected. Josephus says that 1.1 million Jews died and 97,000 became slaves. An interesting footnote to history is the fact that the Colosseum in Rome was built using “spoils taken from Jerusalem.” This means that it was financed with gold taken from the temple and built by Jewish slaves. According to Tacitus, after the great fire of Rome, Nero exterminated a “vast multitude” of Christians. That tribulation lasted 3 ½ years. I refer to these authors and more in Bamboozled Believers.